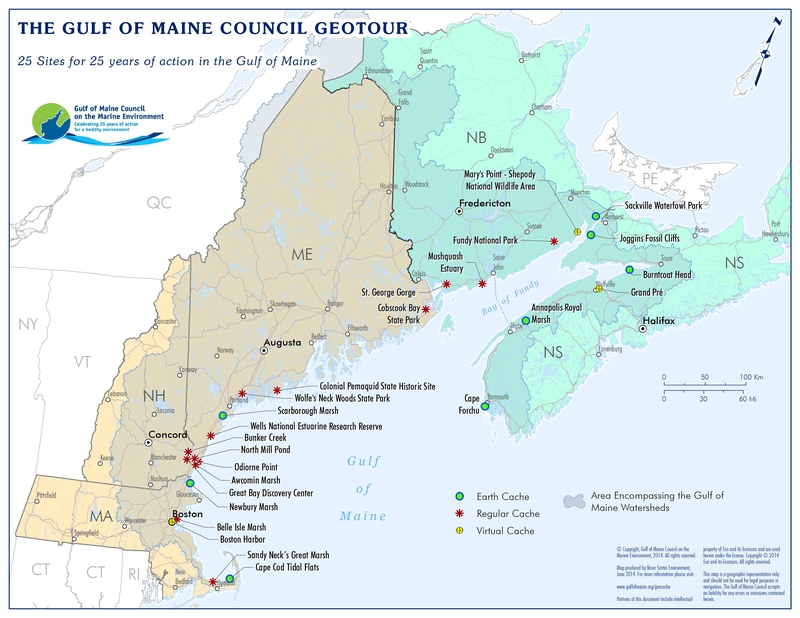 Any person or entity that participates in the Gulf of Maine Council GeoTour does so at his or her own risk. Geocaching, hiking, backpacking and other outdoor activities involve risk to both persons and property. There are many variables including, but not limited to, weather, fitness level, terrain features and outdoor experience, that must be considered prior to seeking or placing a cache. Be prepared for your journey and be sure to check the current weather and conditions, as well as tide times and heights, before heading outdoors. Always exercise common sense and caution. Cache seekers assume all risks involved in seeking a cache. To participate in the Gulf of Maine Council GeoTour, users may want to register at Geocaching.com. Geocaching.com is a third party website owned operated by Groundspeak, Inc. which is the primary facilitator for the Geocaching community worldwide. Please be advised that Geocaching.com / Groundspeak Terms of Service (http://www.geocaching.com/about/termsofuse.aspx) and Privacy Statement (http://www.geocaching.com/about/privacypolicy.aspx) applies to your use of these services. The links to Geocaching.com are provided for participation and informational purposes only, and they do not indicate the Gulf of Maine Council’s endorsement, sponsorship of, or affiliation with Geocaching.com or Groundspeak Inc. or content of those websites, including any advertisements that may be posted. The Gulf of Maine Council, nor any individual member or organization of the GOMC or any volunteer who has contributed to this GeoTour, has no control over, makes no representation or warranty and bears no responsibility for the accuracy, legality or content of the externally linked sites. How to Activate My Geocoin?